an easier section of class III and IV, then one more larger drop. 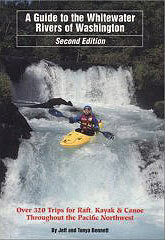 Copyright © 2008, Chris Arnold and Oregon Kayaking. 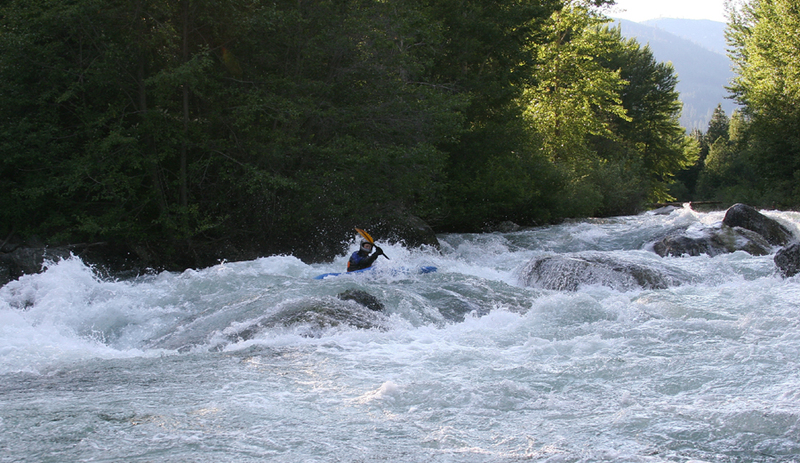 No part of this page may be reproduced, linked, or copied without the express written permission of Chris Arnold and the Oregon Kayaking webmaster. 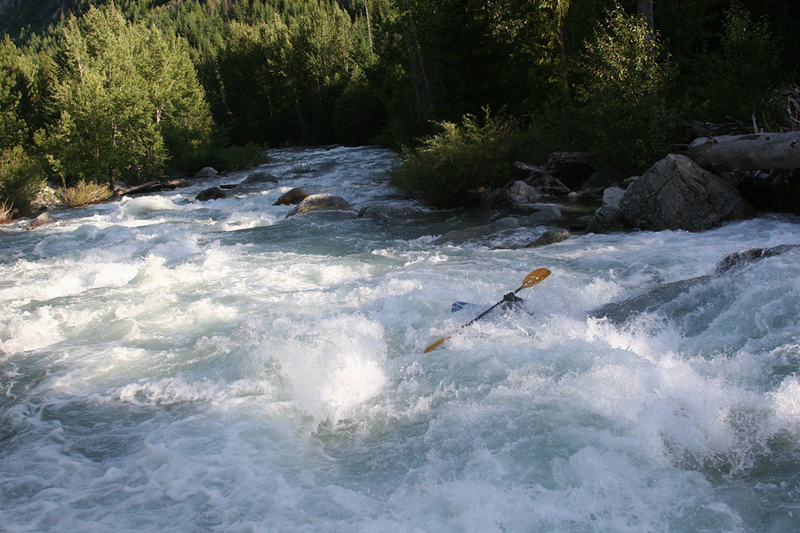 For the Fourth of July Nate Bell, Matt Jordan, and I headed north to the Entiat River. 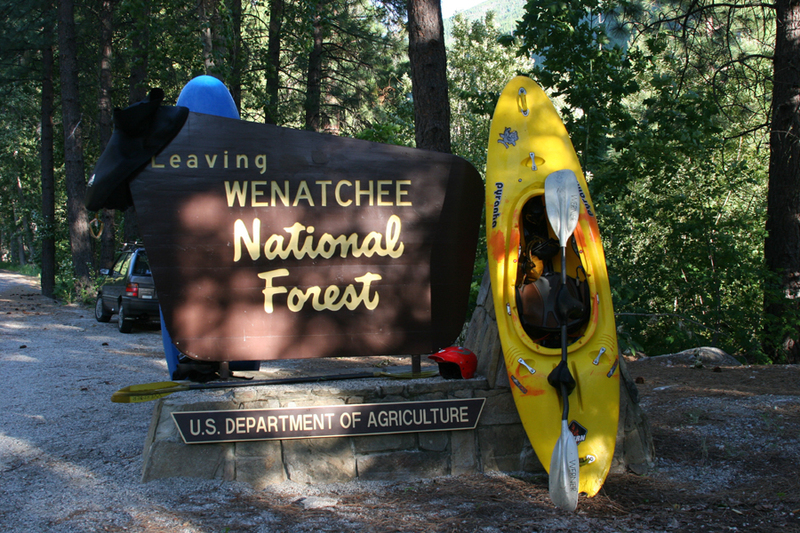 The river is about two hours outside of Wenatchee and well worth the drive if the level is right. We left early on the 4th and managed to reach the campground along the canyon by 3 p.m. Being the 4th, I was almost positive we’d be camping on a deserted road, but to my amazement we ended up having an entire section of the campground to ourselves. Eight bucks a night for an outstanding campsite! 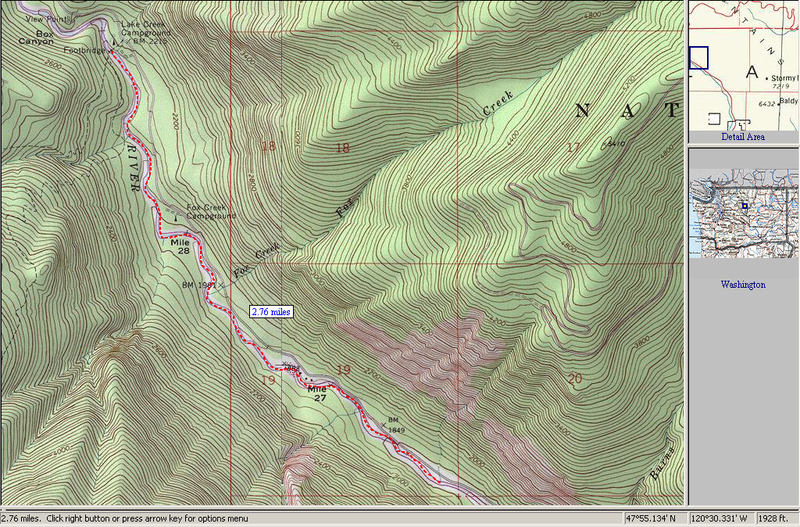 One bit of advice on this section, scout as much of the canyon from the campground as you can! Wood anywhere in the canyon could be very bad. There are also multiple pullouts along Entiat River Road that can be used for scouting. After setting shuttle Matt and I rolled up to the put-in, and were greeted by Nate, who had a big smile on his face.. When we got out of the car he said: "You’re going to love this put-in, guys!" 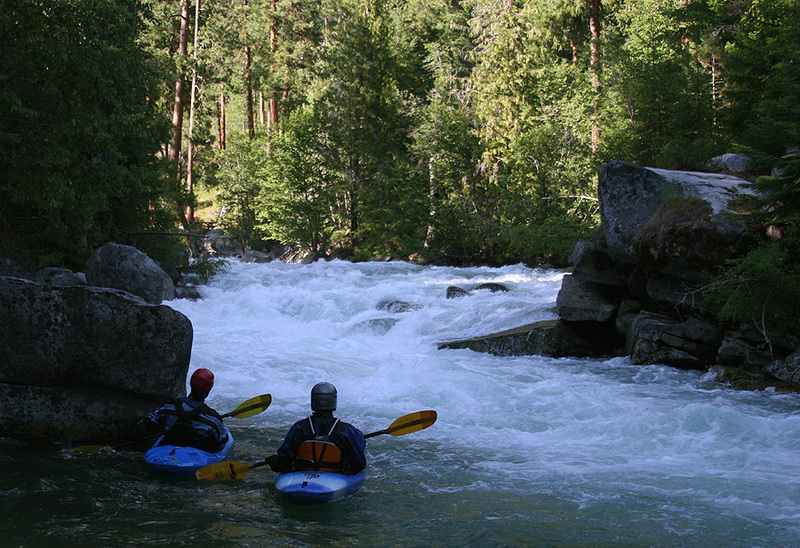 The put in for the Canyon section on the Entiat River.. No warm up here! The canyon section starts off fast with no chance for a warm-up. We put in just below the trailhead bridge in the middle of a steep boulder garden filled with plenty of holes to dodge. There were a good number of eddies to catch at this level making it easy to pick your way down. 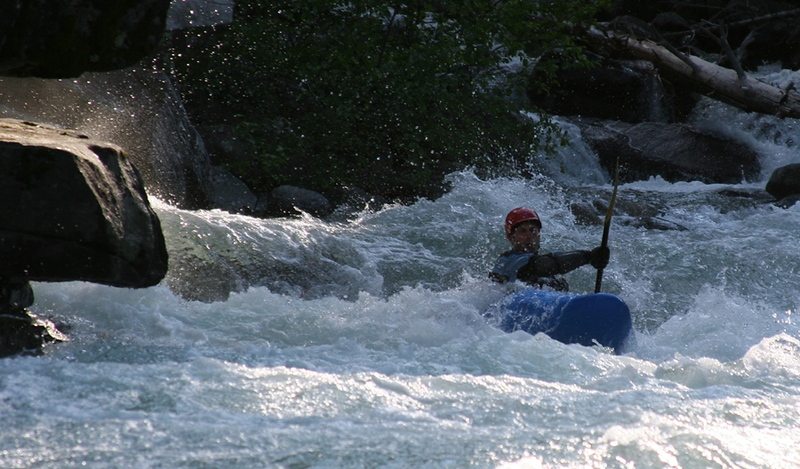 If opening rapid looks intimidating, consider the easier Cottonwood section, located upstream. 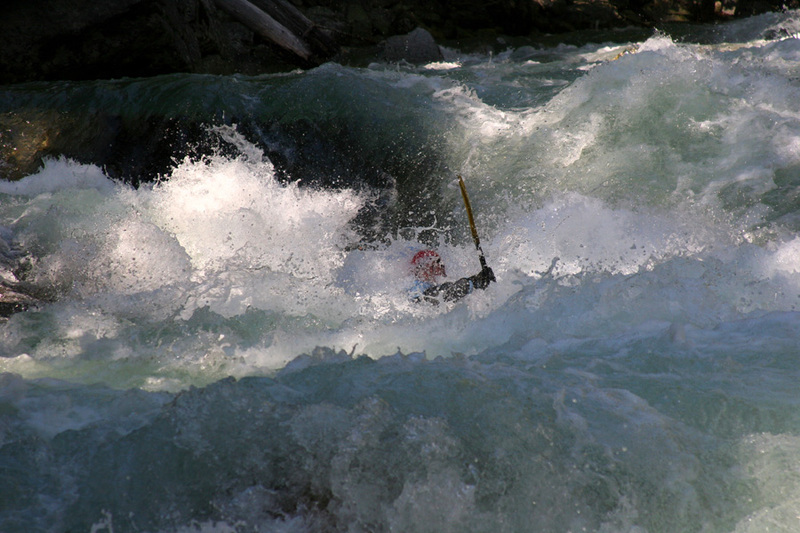 The rapids in the canyon are bigger, and just as fast. Nate and Matt just below the Put-in. 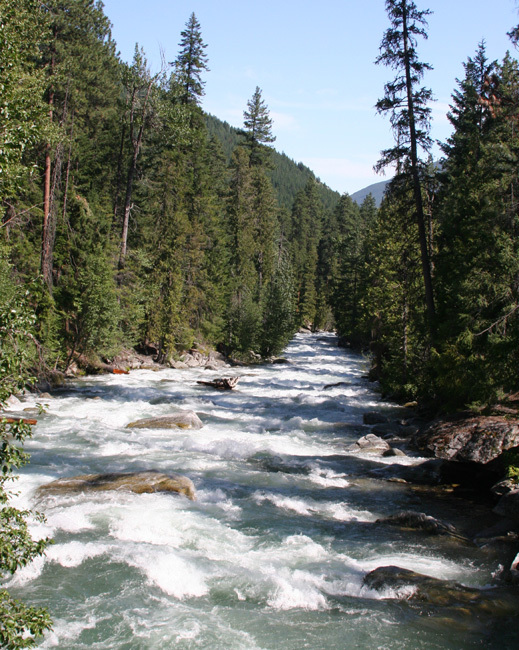 The initial boulder garden ends, and the canyon section begins with a drop consisting of multiple ledges that had collected an almost-river-wide log at its entrance. Note: The log was easy to see from one of the campground trails. Nate and Matt Below the First Significant Drop in the Canyon. After the first drop in the canyon section we eddied out on the right. 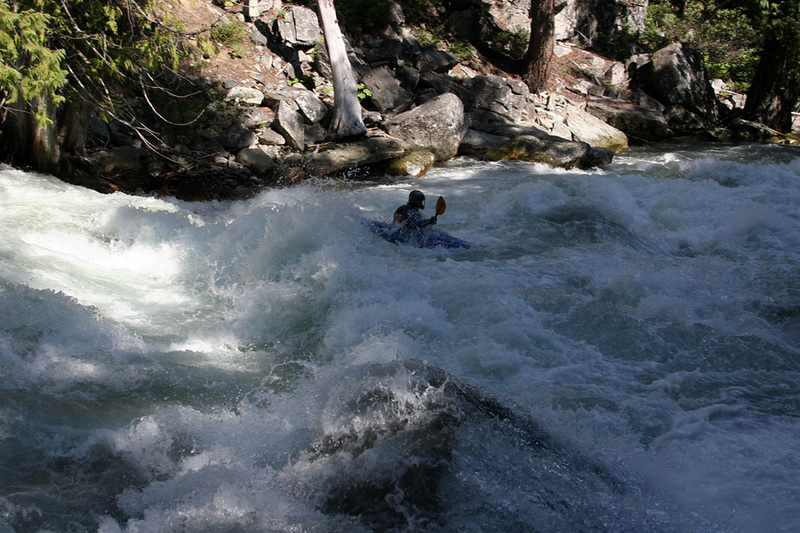 I jumped out and took a less-than-optimal picture and looked downstream. A short section of class IV lead into the next significant drop in the canyon: a larger, two-tiered drop. Nate Below the First Pitch of the Second Drop in the Canyon. Matt Crashing Through the First Hole of the Second Drop in the Canyon. 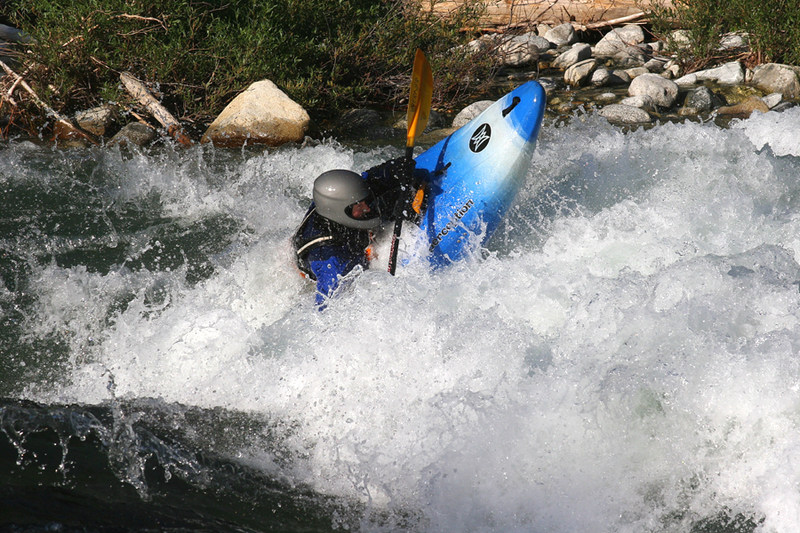 After the two-tiered drop catch an eddy on river right, your breath, and take a look at the next pitch immediately below. If you opt for the boof flake hit it straight or get ready for a ride! Nate Below the Second Big drop in the Canyon, the Boof Flake is just downstream to his left. The third big drop in the canyon was my favorite. On our first run I eddied out on the left, got a fair look at the drop, and then ran from hard right moving left towards the bottom. The drop ended with a big hole, but it was possible to avoid the meat by driving hard left of the ledge. Third Drop in the Canyon, which was my favorite. Matt's "Oh S--t" Face, as he drops into the Third Drop’s Main Hole. Matt, blasting through Bottom Hole of the Third Drop in the Canyon. 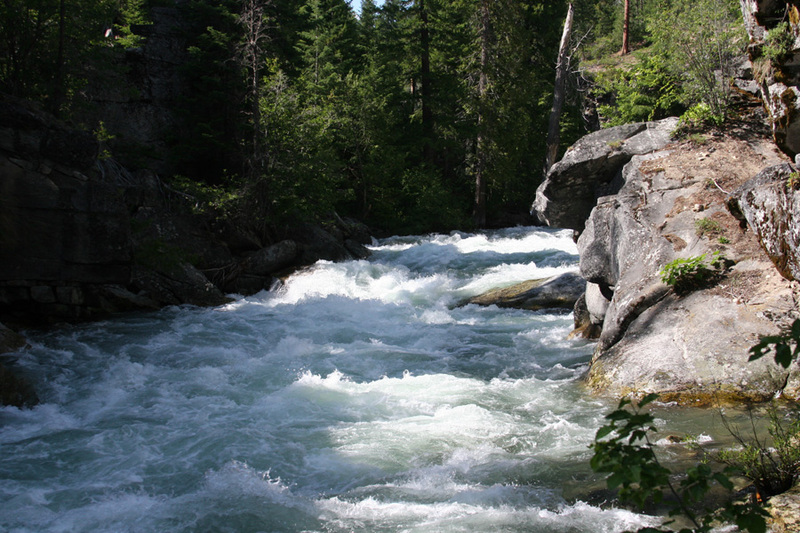 Below the third big drop the canyon walls peeled back and the river calmed down to III+ with the occasional class IV. Matt Emerging from the Canyon. 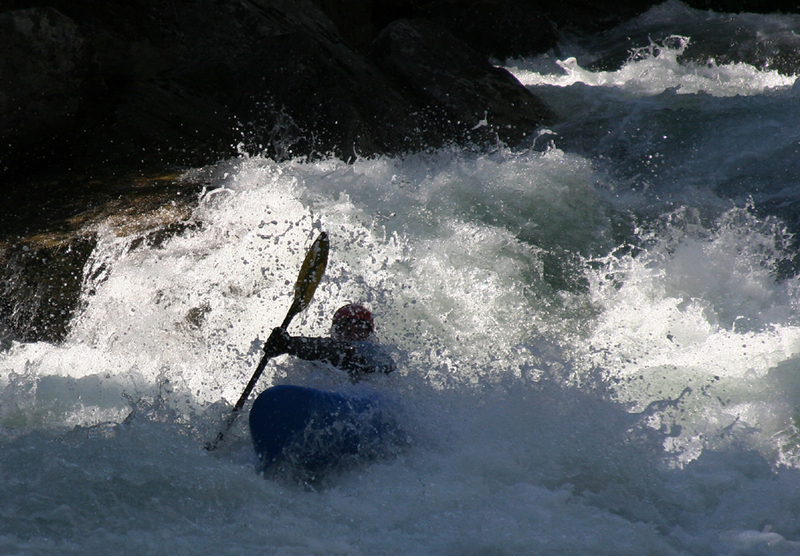 In-between the Canyon section and the final big drop we found a perfect rodeo hole with great eddy service on river right. Nate: the Creek Boat Rodeo Star of the Day. 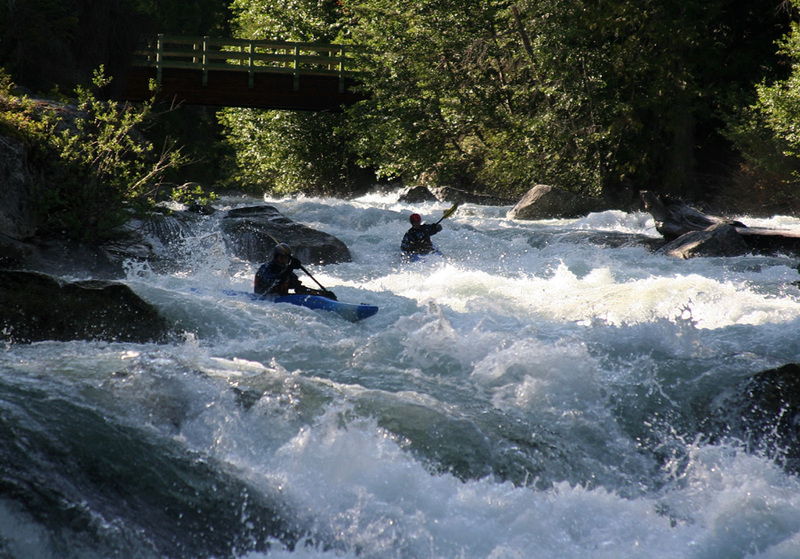 The final significant rapid of the section is easily viewable from the road on the way to the put-in. 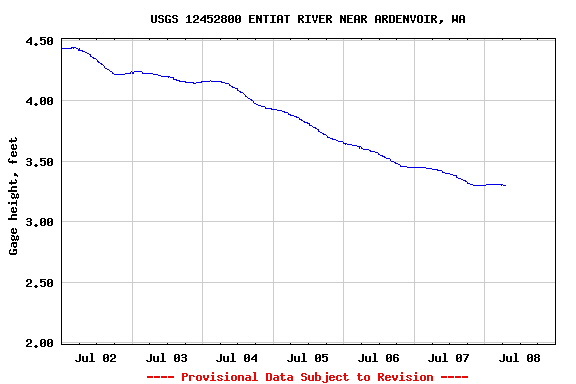 There is a nice class IV lead-in, and a large eddy on river left above the final pitch. 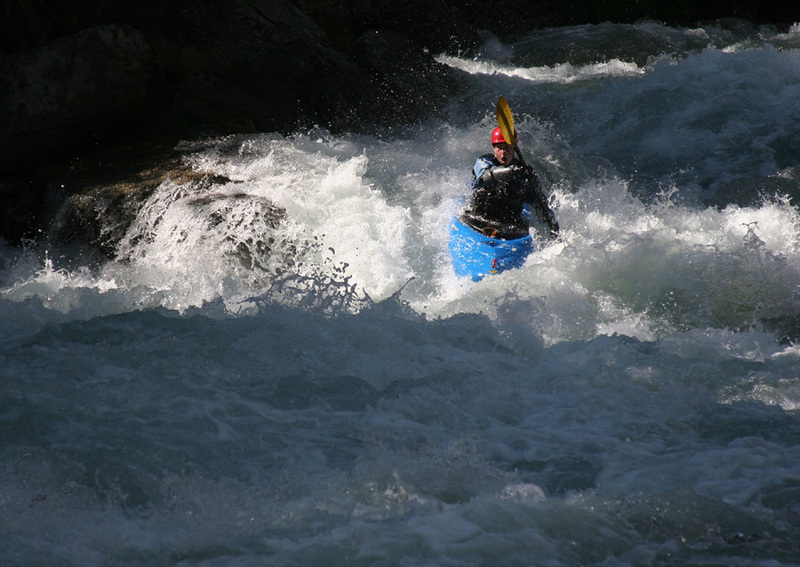 Nate negotiating the lead-in to the final drop. Nate Setting up for the Final Drop. You can also boof the ledge to his left then drive left if you want to avoid the hole. From the eddy on river left we had two options: Option one consisted of moving right onto a large flume of water that ended in a large hole. Option two was to boof a small ledge and work left of the hole. Nate Gutting the final Big Hole, also known as Option one. 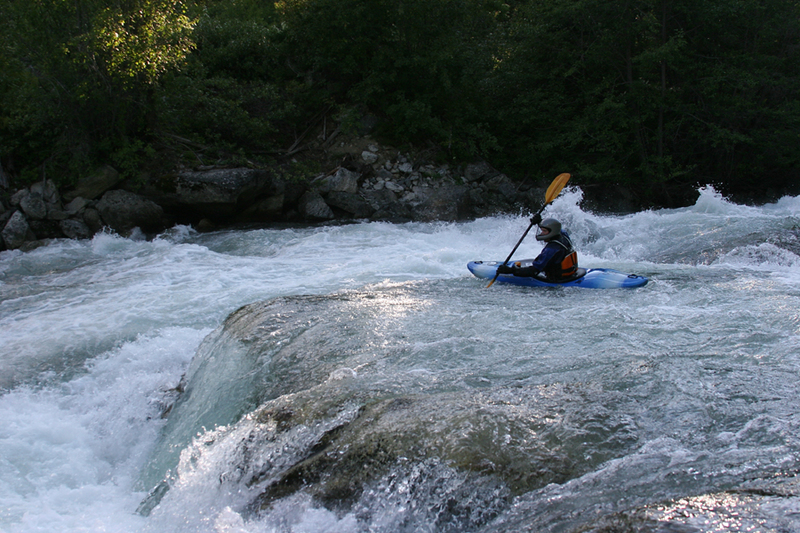 After the last big drop the river really calmed down and we had an easy paddle to the take-out. We ran this section twice on July 4th. 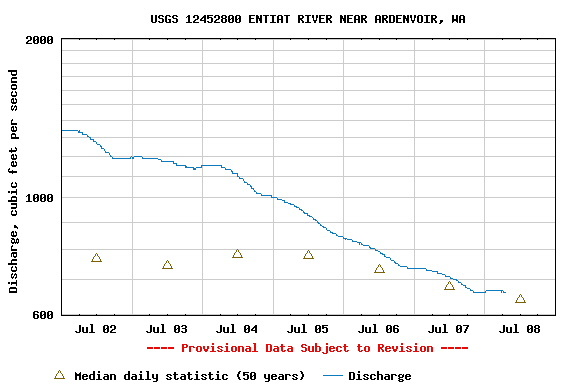 All pictures and descriptions were for a flow of approximately 1,150 cfs on the USGS Entiat River gauge near Ardenvoir, see below. 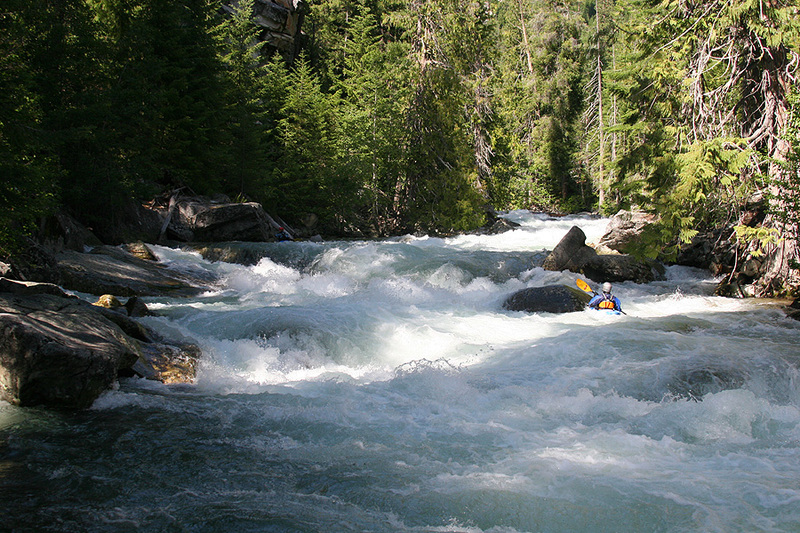 With one of the biggest snowpacks in recent memory, we were lucky to be able to run the canyon with good flows in July. In most years, May or June is best.